Tomorrow will be exactly 1 week since I received my juicer and I am in love. I start every morning with a juice. All those vitamins, minerals and juicy goodness is the first thing that hits my body in the morning and wakes everything up. 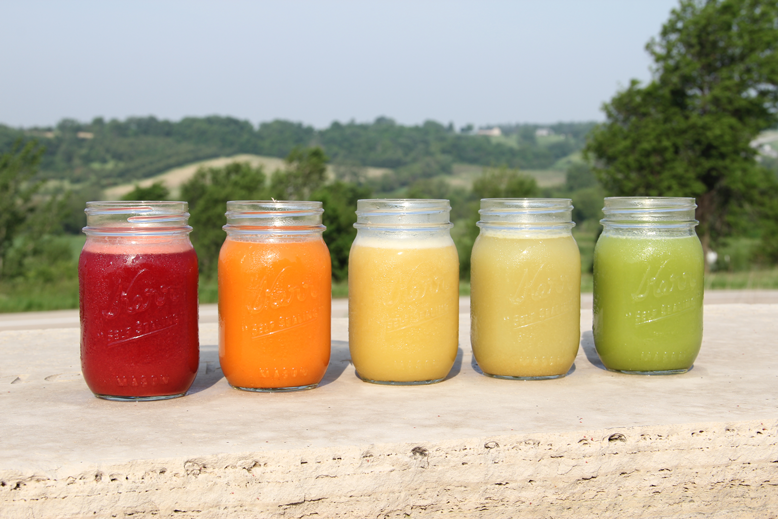 I was off work the first few days, so I consumed 2-3 juices a day while eating about 95% clean. For those that may not know what “clean eating” is…eating nothing that is taken out of a package, has been processed or has an ingredient that I can not pronounce. A lot of fruits and vegetables with minimal chicken and fish. I have chosen for now, to remove all red meat from my diet. What Forks over Knives on Netflix and you’ll understand why, in addition, I find my digestive system doesn’t process it kindly…to me that is a sign to remove it. For the first two days it took my body some time to adjust and I did not venture far from home. Day 3 was met with a visit to the Dr because my entire face and chest broke out in tiny white bumps and hives and I was itchy from here to the heavens! My Dr. smiled, laughed and after our conversation welcomed me to the world of detox and your body trying to expel all the garbage. I was sent home with a prescription to keep doing what I am doing and not itch, by Monday the bumps and hives were gone. Here are a few of other things I have noticed right off the bat…. I have had no desire or need for my morning coffee – no headaches, no caffeine withdrawal, no crankiness. I had it Sunday out of habit and then trying to break the habit on my way into work this week has been interesting. I will be switching to tea and will go from there. I have not woken up once in the middle of night – sleeping solid for the first time since I moved. This may not be souly to juicing, but more a comfort and adjustment to my new surroundings. Perhaps a combination of both. I have been asked by a couple people since yesterday’s post if I will be doing the big 60 day juice cleanse that Joe Cross does in the movie. After speaking with my Dr., the answer is, not at this time. The most I will consider is a 3 day cleanse and that is mostly to remove the refined sugar and cravings that are still running rampant. Last night, I ate a fairly processed meal and let me tell you my body was NOT happy. I am not going to commit to eating 100% clean, healthy and make no mistakes or slip ups because that just isn’t practical or realistic. My goal is to 100% remove refined sugar/sweeteners and to clean eat 90-95% of the time. For my first week it has gone better than expected I am sitting at about 80% which I am happy with. For the first time in a very LONG time I don’t feel deprived, concerned or worried about falling “off this wagon.” This seems easy and simply.